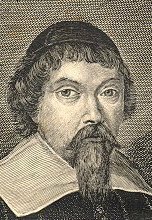 Menasseh Ben Israel (1604-1657), Portuguese Jewish scholar, writer, diplomat and printer, founded the first Hebrew printing press in Amsterdam in 1626. Menasseh maintained friendships with a.o. Vossius, Barlaeus, Hugo Grotius and Rembrandt. True to the tradition of collecting Amsterdam imprints, the Bibliotheca Rosenthaliana acquired a collection of books, printed by Menasseh, which is almost complete. At present the collection consists of 70 editions, in total some 75 editions have been printed. Apart from thse printed editions, the Bibliotheca Rosenthaliana has in its collection 6 autograph letters. These are very rare as hardly any letters by Menasseh have survived. Also part of the collection is a copper-engraving of a portrait of Menasseh by Salmon Italia, and an etching by Rembrandt. Scholars still dispute on the portrait by Rembrandt: does it represent Menasseh, or some other contemporary? The digital collection consists of material belonging to the holdings of the library. Digital additions from other holdings in order to get a virtual completeness will be our aspiration. books There is a complete list of all books with a brief description. A hyperlink, the booktitle, is the link to the separate editions with full descriptions and annotations. It is possible to riffle through the book by turning the numbers of the book openings (not the same as the numbers of the pages) to the left on the screen. The top left corner refers to the complete list of books, the top right corner refers to the full description of the book at hand. autographic letters Two letters by Menasseh addressed to Isaac Vossius have been added to the digital collection. publications Digitalising publications about Menasseh Ben Israel and his works has begun. final report The project with its resulting digital collection is described in detail in the final report (in Dutch) and in an extensive summary in English. Close attention has been paid to OCR with regard to old texts in Hebrew. The choices made with respect to file formats are also explained.